Oxycodone Chemical Formula C18H21NO4 is an opioid analgesic medication synthesized from thebaine. It was developed in 1916 in Germany and introduced to the pharmaceutical market as Eukodal® (also spelled Eucodal) and Dinarkon®. Its chemical name is derived from codeine - the chemical structures are very similar, differing only in that the hydroxyl group of codeine has been oxidized to a carbonyl group (as in ketones), hence the "-one" suffix, the 7,8-dihydro-feature (codeine has a double-bond between those two carbons), and the hydroxyl group at carbon 14 (codeine has just a hydrogen in its place), hence "oxy"codone. In the United States, oxycodone is a Schedule II controlled substance both as a single agent and in combination with products containing paracetamol (aka acetaminophen), ibuprofen or aspirin. It was first introduced to the US market in May 1939 and is the active ingredient in a number of pain medications commonly prescribed for the relief of moderate to heavy pain, either with inert binders (Oxycodone, Oxycontin) or supplemental analgesics such as acetaminophen (Percocet, Tylox) and aspirin (Percodan). Oxycodone is a drug subject to abuse, and is included in the sections for the most strongly controlled substances that have a commonly accepted medical use under the German BetÃ¤ubungsmittelgesetz III) (narcotics law), the Swiss law of the same title, UK Misuse of Drugs Act (Class A), Canadian Controlled Drugs and Substances Act (CDSA), Dutch Opium Law (List 1), Austrian Suchtmittelgesetz (Addictives Act), Australian, New Zealand, Japanese and South African controlled substance laws, to name but a few. It is also subject to international treaties controlling psychoactive drugs subject to abuse or dependence. Oxycodone is commercially made from thebaine, an opiate alkaloid and minor component of opium. The 14' hydroxy group increases potency by about 50% over hydrocodone. The chemical structure of oxycodone is the methylether of oxymorphone: 3-methyl-oxymorphone. It could also be described as 14-hydroxy-7,8-dihydro-codeinone. It is principally supplied as its hydrochloride salt: oxycodone hydrochloride. The terephtalate salt of oxycodone is present in some formulations such as Percodan as 7.6 per cent of the weight of the oxycodone salts content of the product, viz. 5 mg of oxycodone in Percodan is 4.62 mg hydrochloride and 0.38 mg terephtlalate. There does not appear to be a significant difference in the action of the salts. The hydrochloride-terephtalate mixture appears to be part of the original formulation of Percodan by its German manufacturers from more than 75 years ago. Other oxycodone salts used around the world include the phosphate, sulphate, pectinate, tartrate, bitartrate, citrate and iodide. Oxycodone can be administered orally, intranasally, via intravenous/intramuscular/subcutaneous injection, or rectally. The bioavailability of oral administration averages 60-87%, with rectal administration yielding the same results. Injecting oxycodone will result in a stronger effect and quicker onset. Percocet tablets (oxycodone with acetaminophen) are routinely prescribed for post-operative pain control. Oxycodone is also used in treatment of moderate to severe chronic pain. Both immediate-release and sustained-release oxycodone are now available (OxyNorm and OxyContin in the UK). There are no comparative trials showing that oxycodone is more effective than any other opioid. In palliative care, morphine remains the gold standard. However, it can be useful as an alternative opioid if a patient has troublesome adverse effects with morphine. It is effective orally and is marketed in combination with aspirin (Percodan, Endodan, Roxiprin) or paracetamol/acetaminophen (Percocet, Endocet, Roxicet, Tylox) for the relief of pain. More recently, ibuprofen has been added to oxycodone (Combunox). It is also sold in a sustained-release form by Mundipharma, and in the US by Purdue Pharma under the trade name OxyContin (the name is actually short for Oxycodone Continuous release) as well as generic equivalents, and instant-release forms Endone, OxyIR, OxyNorm, Percolone, OxyFAST, Supeudol, and Roxicodone. OxyNorm is available in 5, 10 and 20mg gelcapsules, and favoured among IV injecting opioid users because they contain only 2 inert binders, both insoluble, making it easy to prepare them for injection. OxyNorm is also available as 10mg/ml concentrated liquid in 100ml bottles in some countries, and OxyNorm 1ml injection ampoules of 10mg/ml are currently in their trial stage by the CFK. Roxicodone is a generically made oxycodone product designed to have an immediate release effect for rapid pain relief. The immediate release aspect of Roxicodone makes it ideal for breakthrough pain, which may not be relieved by patients taking baseline medication for chronic pain. Roxicodone is available in 5 (white), 15 (green), and 30 (light blue) mg tablets. Generic versions of Roxicodone may differ in color from the brand name tablets. OxyContin was briefly available in: 5 (white), 10 (white), 15 (pink), 20 (pink), 30 (yellow), 40 (yellow), 45 (yellow), 60 (beige), 80 (green) and 160 (blue) mg tablets. (although note that not all of these dosages are marketed in the USA) and, due to its sustained-release mechanism, is effective for eight to twelve hours. The 160 mg tablets were removed from sale due to problems with overdose, but have been re-introduced for limited use under strict medical supervision. On October 18, 2006, the FDA gave approval for three new dosage strengths, 15mg, 30mg, and 45mg. Oxycontin is made of pure oxycodone and hydrochloride. Nevertheless, an 80 mg oxycontin weighs approximately 260 mg (not including the navy colored coating) due to other compounds. Hydrochloride is found in lots of over and under the counter drugs, hydrochloride makes drugs soluble for our bodies to ingest correctly and quickly. OxyNorm is available in 5, 10, and 20 mg capsules and tablets; also as a 1 mg/1 ml liquid in 250 ml bottles and as a 10 mg/1 ml concentrated liquid in 100 ml bottles. Available in Europe and other areas outside the United States, ProladoneÂ® suppositories contain 15 mg of oxycodone pectinate and other suppository strengths under this and other trade names are less frequently encountered. Injectable oxycodone hydrochloride or tartrate is available in ampoules and multi-dose phials in many European countries and to a lesser extent various places in the Pacific Rim. For this purpose, the most common trade names are Eukodol and Eucodol. Nausea, drowsiness, constipation, lightheadedness, rash or itchiness, dizziness, and emotional mood disorders are the most frequently reported side effects. Other side effects can also include dry mouth ,slightly decreased testosterone levels in men and erectile dysfunction.Oxycodone accumulates in patients with renal or liver impairment, and dose reductions may be needed. Oxycodone is an opioid agonist, and as such is a variation on an ancient theme beginning with the simple consumption or smoking of the alkaloid-bearing parts of Papaver somniferum, the opium poppy, first cultivated circa 3400 BC in lower Mesopotamia. Ancient Persians, Sumerians, Assyrians, Babylonians, and Egyptians found that smoking the extract derived from the seed pods yielded a pleasurable, peaceful feeling throughout the body. The Sumerians called the poppy plant "Hul Gil" or "joy plant". Cultivation and use spread quickly to the rest of the Persian Gulf, Levant and the Arabian Peninsula, eventually reaching India and China. Oxycodone was first synthesized in a German laboratory in 1916, a few years after the German pharmaceutical company Bayer had stopped the mass production of heroin due to addiction and abuse by both patients and physicians. It was hoped that a thebaine-derived drug would retain the analgesic effects of morphine and heroin with less of the euphoric effect which led to addiction and over use. To some extent this was achieved, as oxycodone does not "hit" the central nervous system with the same immediate punch as heroin or morphine and it does not last as long. The subjective experience of a "high" was still reported for oxycodone, however, and it made its way into medical usage in small increments in most Western countries until the introduction of the OxyContin preparation radically boosted oxycodone use. The introduction of OxyContin in 1995 resulted in increasing patterns of abuse. Unlike Percocet, whose potential for abuse is limited by the presence of paracetamol (acetamenophin), OxyContin contains only oxycodone and inert filler. Abusers simply crush the tablets, then either ingest the resulting powder orally, intranasally, via intravenous, intramuscular, or subcutaneous injection (by dissolving the powder), or rectally to achieve rapid absorption into the bloodstream. Injection of OxyContin is particularly dangerous since it contains binders which enable the time release of the drug. [original research?] The vast majority of OxyContin-related deaths are attributed to ingesting substantial quantities of oxycodone in combination with another depressant of the central nervous system such as alcohol or benzodiazepines. While high doses of oxycodone can be fatal to an opiate-naÃ¯ve individual in and of itself, lethal overdoses of only oxycodone rarely occur. It was once thought that opioids would be less subject to recreational use when one or more additional analgesics are added, since, for example, the amount of paracetamol present in higher doses of Percocet causes stomach upset and liver damage. However, it has been demonstrated that abusers seeking the euphoric "high" are not deterred by these potential side effects or toxicities. Abusers soon discovered that extremely simple methods to separate the ingredients exist, particularly due to the widely disparate solubility of the alkaloids and analgesics in water ("cold water extraction"). Oxycodone has similar effects to morphine and heroin and appeals to the same abuse community. Armed robberies of pharmacies where the robber demanded only OxyContin, not cash, have occurred. In some areas, particularly the eastern US, OxyContin has been the drug of greatest concern to enforcement authorities, although trustworthy data on the actual incidence of "Oxy abuse" have been difficult to establish. Oxycodone is becoming an increasingly publicized and known drug to the general public. The discovery of its recreational benefits has led to an illicit underground market. Due to acts such as pharmacy diversion and "doctor shopping", the drug is widely available to those without a prescription. The increased misuse of the drug has led to a higher number of emergency department mentions and deaths associated with oxycodone. Between 1994 and 2001, there was a reported 352% increase in ER visits related to all forms of oxycodone usage. In Australia, OxyContin is covered by the PBS and a patient can potentially get up to sixty tablets for as little as $4.90AUD. The NSW Rural Doctors Network notes "Some patients who are legitimately prescribed strong opioids, by a pain clinic or for a terminal condition, will sell part, or all, of their prescription on the illicit drug market to augment their income" and "â€˜Doctor shoppingâ€™ data for 1999/2000 for Australia show that a total volume of 262 923 codeine compound analgesics and narcotic prescriptions were written for 8780 known abusers. These patients saw more than 15 separate doctors in 1 year. The cost of these prescription drugs for 3000 patients, in NSW alone, was $759 954. The problem is, however, much more widespread than these figures indicate. Many more patients avoid detection by requesting private prescriptions, and are not reflected in official government statistics. There are a large number of these white-collar drug users, adding incalculably to a huge problem". This has led to Federal tightening of restrictions from May 2006 (see Regulation below). Illegal distribution of OxyContin occurs through pharmacy diversion, physicians, "doctor shopping," faked prescriptions, and robbery--all of which divert the pharmaceutical onto the illicit market. The increase of this situation coincides with the increase in the illegal use of this drug. The oxycodone contained in OxyContin produces typical opioid effects, and is considered a "reasonable substitute" for heroin, so much so that OxyContin is often referred to as "hillbilly heroin". The most commonly diverted dosages are the 40mg and 80mg strengths. In palliative care oxycodone, like hydromorphone and fentanyl, is viewed as a second line opioid to morphine. There is no evidence that any opioids are superior to morphine in relieving the pain of cancer, and no controlled trials have shown oxycodone to be superior to morphine.. However, switching to an alternative opioid can be useful if adverse effects are troublesome, although the switch can be in either direction, ie. some patients have fewer adverse effects on switching from morphine to oxycodone (or hydromorphone or fentanyl), while others do better on switching to morphine. Oxycodone has the disadvantage of accumulating in renal and hepatic impairment. In addition, and unlike morphine and hydromorphone, it is metabolised by the cytochrome P450 enzyme system in the liver, making it vulnerable to drug interactions. It is metabolised to the very active (but non-analgesic) oxymorphone, and some people are fast metabolisers resulting in reduced analgesic effect but increased adverse effects, while others are slow metabolisers resulting in increased toxicity without improved analgesia.,  These factors make the effects of oxycodone less predictable than opioids such as morphine or hydromorphone. Cicero TJ, Inciardi JA, MuÃ±oz A. Trends in abuse of Oxycontin and other opioid analgesics in the United States: 2002-2004. Journal of Pain. 2005 Oct;6(10):662-72. Calman K. Doyle D, Hanks G, Eds. Oxford Textbook of Palliative Medicine, third edition. Oxford: Oxford University Press, 2004. Kalso E. Oxycodone. Journal of Pain & Symptom Management. 29(5):47-56, 2005 May. Otton SV, Wu D, Joffe RT, Cheung SW, Sellers EM. 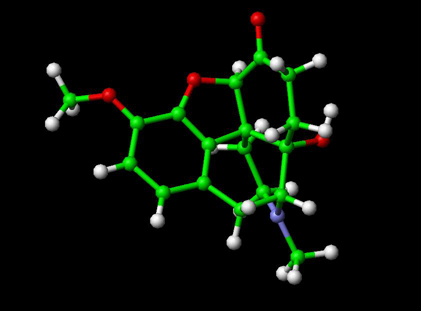 Inhibition by fluoxetine of cytochrome P450 2D6 activity. Clin Pharmocol Ther 1993 Apr; 53(4) 401-9.